This zoom gear enables zooming for the Canon EF 8-15mm f/4L Fisheye USM lens via the focus/zoom knob.. Lens supporter with focus gear (via the port's knob) for Canon EF 100mm f/2.8L Macro IS USM lens on ..
Nexus M6 mount macro port MP105VRMF-6 for following lenses: Nikon AF-S VR Micro-Nikkor 105mm f.. Lens supporter with focus gear (via the port's knob) for Nikon AF-S VR Micro-Nikkor 105mm f/2.8G IF-..
Neuxs port extension 15mm for M6 mount ports ..
Fisheye Port NF15-6 V2.0 for: Canon EF 15mm f/2.8 Fisheye Lens Nikon AF DX Fis.. 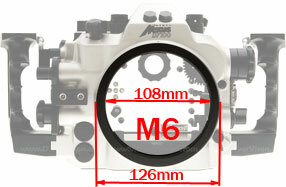 Allow attachment of Anthis M6 ports to Sea&Sea MDX-series housings. .. This zoom gear enables zooming for the Nikon AF-S Zoom-Nikkor 14-24mm f/2.8G ED (1.7x) lens via the .. It's used to install in Nexus M6 housing and transfom into M4 ports. .. This zoom gear enables zooming for the Olympus Zuiko Digital ED 14-42mm f/3.5-5.6 lens via the focus.. This zoom gear enables zooming for the Olympus Zuiko Digital ED 9-18mm f/4.0-5.6 lens via the focus/.. This focus gear enables focusing for the Olympus Zuiko Digital ED 8mm f/3.5 Fisheye lens via the foc.. This zoom gear ZG-NAFZ10/24G enables zooming for the Nikon AF-S DX NIKKOR 10-24mm f/3.5-4.5G ED lens..
Anthis focus gear FG-EFM100F28USM for Canon EF 100mm f/2.8L Macro IS USM Lens via the focus/zoom kno..